As immigration attorneys, we understand that many people are interested in working in the United States lawfully. A “work card” or more accurately a “employment authorization document” is one way for people to show they can work legally in the United States. U.S. employers must check to make sure all employees, regardless of citizenship or national origin, are allowed to work in the United States. If you are not a U.S. citizen or a permanent resident, you may fall into one of three categories of persons who are eligible for employment authorization. 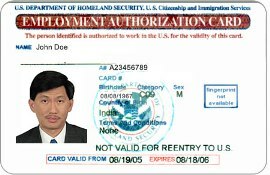 Some of those that fall in the first and third categories (including those who have a pending Form I-485, Application to Register Permanent Residence or Adjust Status) are required to apply for work authorization and an Employment Authorization Document (EAD) with the Form I-765, Application for Employment Authorization prior to seeking work in the United States. The EAD is the proof that you will show to your employer that you are allowed to work in the United States. In most cases, EADs are granted for a 1 year period. If you are still eligible for work authorization but your EAD has expired, you should file for a renewal EAD by submitting a Form I-765, Application for Employment Authorization. You cannot file for a renewal EAD more than 120 days before your original EAD expires. A replacement EAD replaces a lost, stolen, or mutilated EAD. In addition, an EAD may be replaced without fee for USCIS error when it was issued with incorrect information, such as a misspelled name. You must file Form I-765 to replace an EAD. If you would like to find out if you are eligible for a work card, please feel free to contact our office or you can look on the instruction page of the I-765 application form. At Geygan and Geygan, we focus our practice on immigration matters so we are uniquely qualified to help you and your family. Success with immigration matters requires a full understanding of the facts, the immigration law and the current policies. Please contact our office to discuss how we can help you. All conversations are confidential. It’s easy to get help. Call or email our immigration lawyers today (Thomasjr@geygan.com.) We will gently walk you through your immigration issues and aggressively fight for your legal rights. Call Geygan & Geygan today: 513-793-6555.